The Move Tool (V) moves a selected area or an entire layer. You can invoke the Move Tool temporarily when using most other tools by holding down the Ctrl key (Command key on a Mac). For most tools, holding Ctrl-Alt (Command-Option on a Mac) and dragging a selected area will temporarily invoke the Move Tool, allowing you to move and duplicate the selected layer quickly. You can also duplicate a layer by holding down the Alt key (Option key on a Mac) while using the Move Tool, as shown in the image below. The Crop Tool (C) is used to trim images. Create a selection using the Crop Tool, then double-click the center of the selection, or press Enter, to crop the image to the size of the selection. To cancel without cropping, select another tool or press the Esc key. 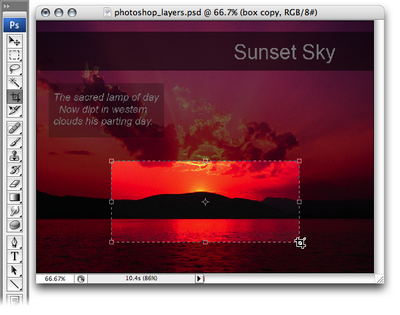 You can use the Crop Tool to resize your canvas. Expand your document window so that it’s larger than the image area, and create a crop selection that includes the image and extends onto the gray areas “outside” the image. Applying this crop will resize your canvas to include those extended boundaries, making your canvas larger. Apart from its extraordinary photo editing abilities, the multi-talented Photoshop also provides drawing and painting tools that allow you to create your own shapes and backgrounds. The Brush Tool (B) is suitable for soft-edged painting or drawing. Draw strokes by clicking and dragging the mouse over the canvas. You can change the brush size and other settings in the options bar at the top of the window. The Pencil Tool (B) is suitable for hard-edged drawing or painting and has similar options to the Brush Tool for setting its size, opacity, and more. 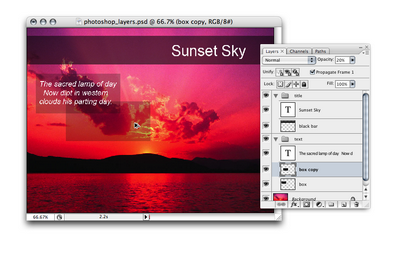 The Pencil Tool is often used for drawing on, and editing individual pixels in, zoomed-in images. The Eraser Tool (E) removes pixels from the canvas. 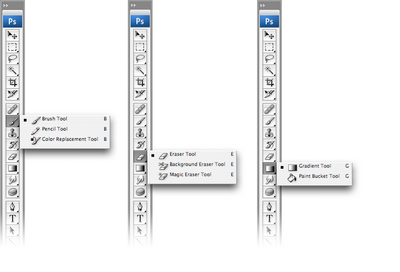 You can choose between Pencil, Brush, or Block mode from the Mode drop-down menu in the options bar. 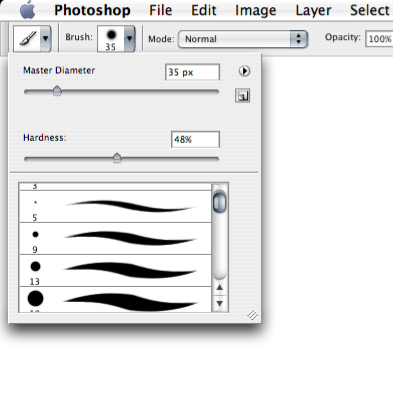 Unlike the Brush Tool, the Pencil Tool’s edges are aliased. 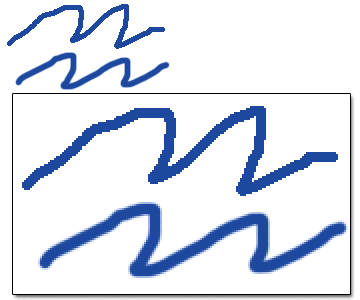 The term aliased refers to the edges of an object being “jagged,” in contrast to an anti-aliased object, in which the edges are “smooth.” In the two examples shown here, the top shape in each example was created using the Pencil Tool, while the bottom shape was created using the Brush Tool. Notice the difference in the “jaggedness” of the edges of these curves. We’ll look more closely at anti-aliasing when we discuss the Text Tool. The Paint Bucket Tool (G) fills a selection with a flat color. To use the Paint Bucket Tool, click once in the area that you wish to fill. If the chosen area is not within a selection, the Paint Bucket Tool will fill all similarly-colored pixels within the vicinity of the clicked area. The Gradient Tool (G) fills a selection with a blend of two or more colors, known as a gradient. 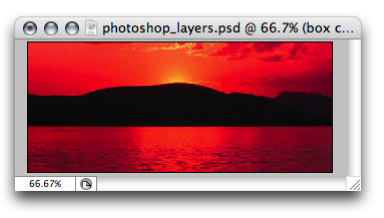 You can easily create your own gradient, or use any of the preset gradients available in Photoshop. 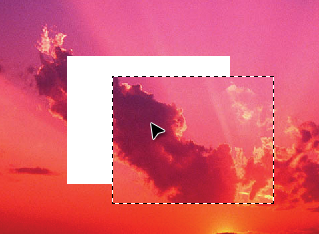 Display the gradient presets and tools by clicking on the small triangle on the right-hand side of the Gradient Tool. Apply a gradient by setting your desired colors, choosing your gradient style, then clicking and dragging the cursor over the area to be filled. I find that I use the first two gradients — the foreground-to-background gradient, and the foreground-to-transparent gradient — most often. The former will blend your foreground color into your background color, while the latter will blend your foreground color into a transparent background, giving it a “fading out” effect. The Text Tool (T), true to its name, creates text layers. This one’s easy to use — just select the Text Tool, click on the canvas, and start typing! You can also click and drag to create a rectangular text area that will force text to wrap within its boundaries. You can change the font size, color, and other text properties using the options bar along the top of the window. When the Text Tool is active, you can move the cursor outside of the text area. The cursor will change from the “text insert” cursor to the “move” cursor, and you’ll be able to move the text layer around. It’s worth noting that when the Text Tool is active, you can’t use keyboard shortcuts to access other tools. This may seem like an obvious thing to point out now, but it won’t always be so apparent — especially when your text mysteriously starts spurting strange characters because you’ve been trying to use the shortcut keys! To finish using the Text Tool, press Ctrl-Enter (Command-Return on a Mac). You can then resume your regular keyboard shortcutting! You can create shapes simply by clicking and dragging Photoshop’s Rectangle, Rounded Rectangle, Ellipse, Polygon, Line, and Custom Shape tools (U). The specific options for each shape tool are displayed in the options bar, and you can access additional options by clicking on the arrow to the right of the Custom Shape button. For example, the Line Tool has options for displaying arrowheads, and for controlling the shapes and sizes of those arrowheads, as shown in the example below. Your shape will be created as a solid-colored layer covered with a vector shape mask. Confused? Think of the mask as a sheet of dark paper that has a hole (your shape) cut out of it so that the color shines through the hole. 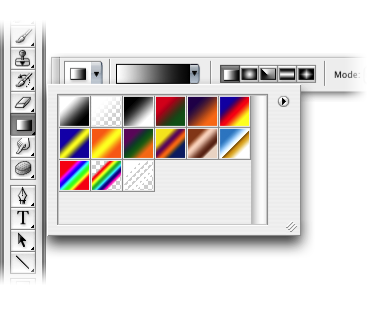 To change the color,double-click on the color block in the Layers palette as shown in this example. To change the vector shape mask, use the vector editing tools. 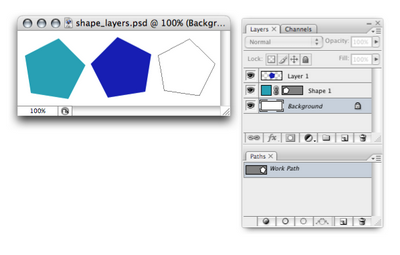 as a path – Your shape will be created as a path in the Paths palette, as shown in the example above (in which the path has been named Work Path). as filled pixels – Your shape will be created on whichever layer is currently selected. I created a new layer, then created a shape using the Fill pixels option on Layer 1 in the above example. And if you enjoyed reading this post, you’ll love Learnable; the place to learn fresh skills and techniques from the masters. Members get instant access to all of SitePoint’s ebooks and interactive online course Foundations of Photoshop.